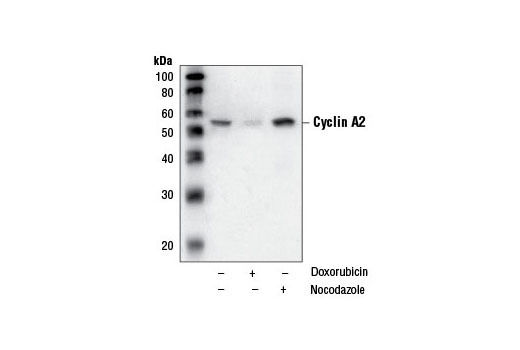 Western analysis of extracts from Hela cells that were untreated, treated with doxorubicin (0.5 µM, 24 hours), or with nocodazole (50 ng/ml, 24 hours), using Cyclin A2 (BF683) Mouse mAb. Cyclin A2 (BF683) Mouse mAb detects endogenous levels of cyclin A2 and does not cross-react with other cyclins or Cyclin A1. Monoclonal antibody is produced by immunizing animals with a recombinant human cyclin A2 protein. While overcoming the G1/S checkpoint to commence DNA replication requires cyclin E, and traversing the G2/M checkpoint to initiate mitosis requires cyclin B to be present, cyclin A seems to be required for both S-phase and M-phase (1). A number of studies have described the ability of over-expressed cyclin A to accelerate the G1 to S transition causing DNA replication, and cyclin A antisense DNA can prevent DNA replication (2-4). Cyclin A availability is apparently the rate-limiting step for entry into mitosis, and cyclin A is required for completion of prophase (5). At late prophase, cyclin A may no longer be necessary as cdc2/cyclinB1 becomes active (5). Pagano, M. et al. (1992) EMBO J 11, 961-71. Resnitzky, D. et al. (1995) Mol. Cell. Biol. 15, 4347-52.
d'Urso, G. et al. (1990) Science 250, 786-91. Zindy, F. et al. (1992) Biochem. Biophys. Res. Commun. 182, 1144-54. Furuno, N. et al. (1999) J. Cell. Biol. 147, 295-306.